Aye Aye arrived first at Yangon orphanage six years ago. She came from a very poor family. She has both parents but her father is a disabled man and could not work, and her mother is working hard to feed the whole family. One of the local preachers there asked if we would accept her and we did. She knew of her family situation well when we accepted her. She was able to adjust her orphanage situation very well. The only thing was she was very shy, which made it hard to talk with her and the other thing is the language problem. In Yangon, we speak Burmese and she could not speak Burmese well. So between that and her shyness, it was hard to talk with her. When we sent her to the school in grade 5, and due to her shyness and the language difficulty, the school teachers thought she was poor academically and she had a struggle in school. As she could not do well in the school academically, the teachers let her repeat the same class in next year. After that, she began doing better in the class. She has been an obedient student from the beginning. Four years ago, we planned to start another orphanage in Jung Byaw, Ayeyarwaddy division, and we would like to send two of the kids to that new orphanage. We chose Aye Aye, as one of the two, and she was willing to move to that new orphanage. The reason we sent two kids to that new orphanage is that the new kids can learn from those two how to live in the orphanage. And we chose her because she is one of the most obedient girls and we trust her. 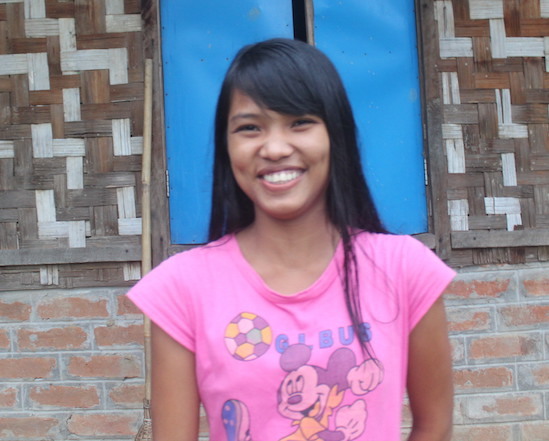 She is now in grade 10 and is happy living in the orphanage. She is a good kid and growing in the Lord. Thank you very much for praying and supporting her.